1 of 3 Whisk together tomato sauce, vinegar, onion, brown sugar, molasses, salt and pepper in slow cooker insert. Add chicken breasts and thighs. Cover and cook on HIGH for 6 hours or on LOW for 8 hours. 2 of 3 Uncover and remove chicken from sauce to a bowl. Pour sauce into a medium pot. In a small bowl, blend cornstarch and 1 tbsp water. Stir into sauce in pot. Bring to a boil; boil 1 minute until thickened. 3 of 3 Meanwhile, with 2 forks, roughly shred chicken. Pour sauce over chicken and gently stir to combine. 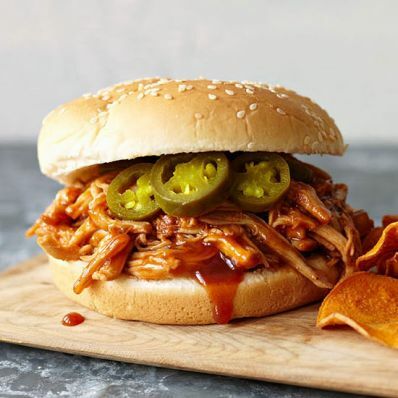 Spoon shredded chicken mixture onto rolls and top with sliced jalapenos, if desired.